There’s a lot to like in the new $2.3 billion transportation package passed by the Pennsylvania House of representatives last week. Philadelphia transit agency SEPTA gets a big funding boost, enough to spare disastrous service cuts. Pittsburgh transit will also get some much welcome financial stability after years of uncertainty, fare hikes, and threats to service. Meanwhile, advocacy groups are calling increases to biking and walking funds historic. Those will be funded by higher taxes on oil and gas distributors and also small increases in vehicle registration and licensing fees. Tremendous credit for this success goes to PennDOT Secretary Barry Schoch, who worked diligently for several years to make the case for the nearly $2.4 billion package, and fought hard to keep the issue front and center even after the House was unable to take a vote in June and rejected versions of the bill twice on Monday night. Explicitly states that Pennsylvania’s comprehensive transportation system includes Pennsylvania’s “numerous bicycle and pedestrian facilities,” which will make it easier for bicycle/pedestrian projects to compete for highway funds. The biking and walking community put its oar in the water to help secure this legislative success. With your help, we fought hard for biking and walking to be included in the bill and to receive a minimum-floor amount of the multi-modal fund. 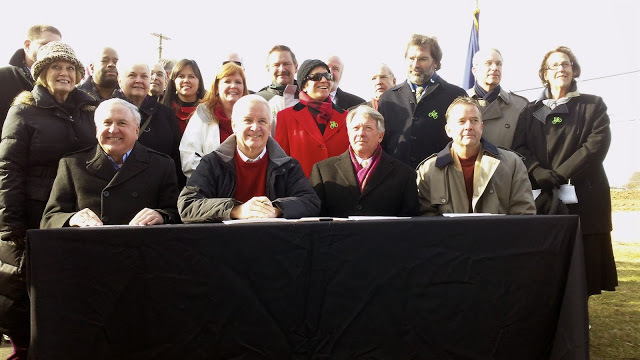 This success is a result of years of coalition work with the Keystone Transportation Funding Coalition and the health groups that collaborated on Walk Ride PA. Elsewhere on the Network today: Systemic Failure reports that San Jose is removing a buffered bike lane, saying its installation was a mistake. Missouri Bike Federation reports that the state has approved an $8 billion transportation spending package that affords $800 million to local communities. And Seattle Transit Blog says Sound Transit should preserve the transit routes that go to the most densely populated, walkable areas.